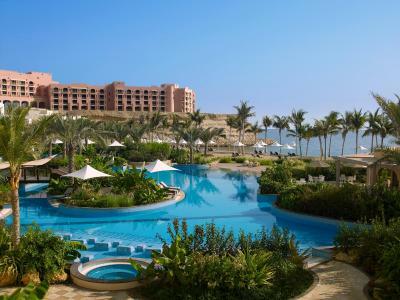 Lock in a great price for Shangri-La Barr Al Jissah Resort & Spa – rated 8.5 by recent guests! Breakfast buffet was very good . Bedroom good size. Pool configuration very good . The overall concept is nicely arranged. Considerable number of guests but conviniently well managed. The heritage village, specifically the action zone is high standard, but might be better advertised. Amazing hotel. Room, spa and breakfast all perfect. The location was amazing - so beautiful and we loved the beaches as well as the pools and of course the lazy river. The buffet breakfasts and dinner were superb: lots of selection and delicious. My daughter also loved the splash pad. The lounges were very comfy near the pool and beach, as were the beds. Staff were very helpful. We absolutely love this resort and hope to come back again sometime (this was our second visit). The breakfast included variety of choices. Chi Spa has good services. Fantastic location and the layout of the hotels with the along the beach, with pools and a lazy river connecting them was a great feature. The setting in general is amazing. everything was nice, access to the beach, entertainment for kids and adults were very pleasant and enjoyable, breakfast buffet was very nice and there were variety of food, SPA was very nice, the treatment room was private room with locker, toilet, Jacuzzi, especially for covered ladies. 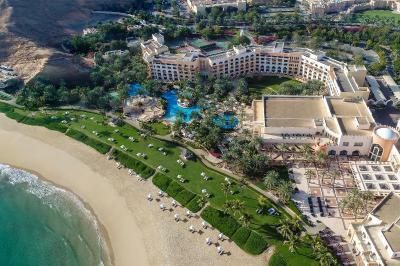 Shangri-La Barr Al Jissah Resort & Spa This rating is a reflection of how the property compares to the industry standard when it comes to price, facilities and services available. It's based on a self-evaluation by the property. Use this rating to help choose your stay! 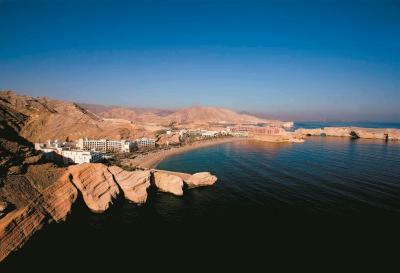 Al Waha hotel, with a minimum room size of 32 sqm each is the ideal getaway for families. Guests enjoy a balcony or patio facing the sea or pool. Al Bandar hotel offers rooms with a minimum of 38 sqm of space, a balcony or terrace with views of the garden, sea or pools. 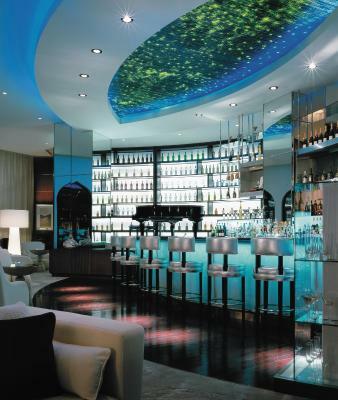 Guests have access to a total of 19 bars and restaurants across the resort. 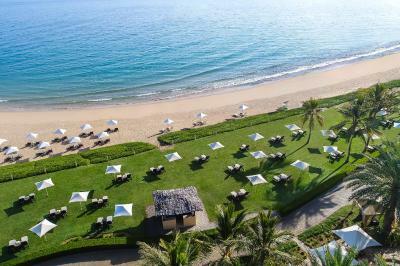 There are seven main restaurants, two all-day dining outlets, two pool bars, two lobby lounges, six cafes and bars. 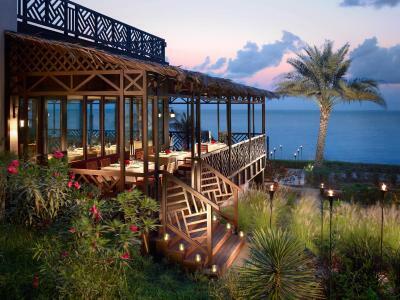 Bait Al Bahr is the seafood restaurant with splendid terrace views of the sea; BAB Lounge is hotel’s seaside rooftop bar; and Capri Court is contemporary Italian restaurant. 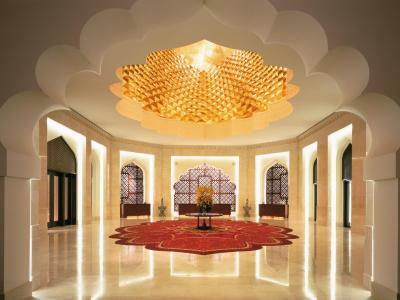 Guests have access to two additional restaurants, Shahrazad and Sultanah, in the adjacent Shangri-La Al Husn Resort & Spa. The resort offers 1,500 feet beach, six swimming pools supervised by lifeguards and 1,650 feet Lazy River floating between the two hotels' main swimming pools. Thrilling watersports activities hydro-sport jet packing, wakeboarding, waterskiing, clear-bottom kayaking, standup paddle boarding and so much more. CHI, The Spa features some of the largest and most luxurious private spa suites and villas in Oman, all within a secluded setting among lush gardens. 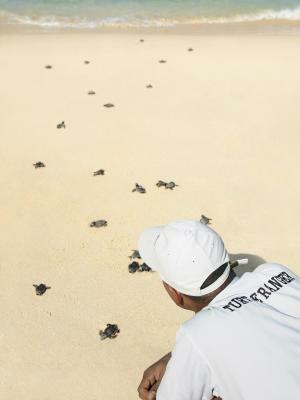 The ecofriendly hotel also hosts Turtle Ranger program that protects and nurtures new hatch-lings and turtle nests. Muscat International Airport is a 45-minute drive away. Muscat City Center Mall can be reached by car in 25 minutes. 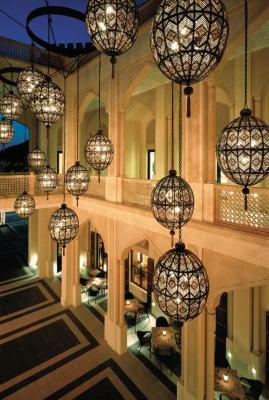 Central Muscat is a 15-minute drive away. Tours of nearby historic sites, desert safaris and boat excursions can be arranged. Free WiFi is available throughout the entire resort. This property also has one of the top-rated locations in Muscat! Guests are happier about it compared to other properties in the area. 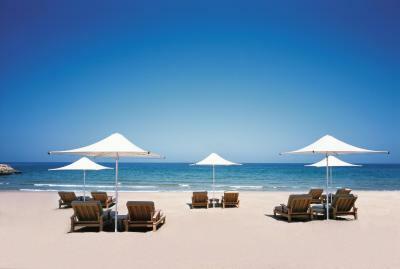 When would you like to stay at Shangri-La Barr Al Jissah Resort & Spa? Located in Al Waha hotel, the Superior Rooms offer accommodations featuring luscious views of the lush gardens and pool. The balcony or patio are furnished with a table and two chairs. 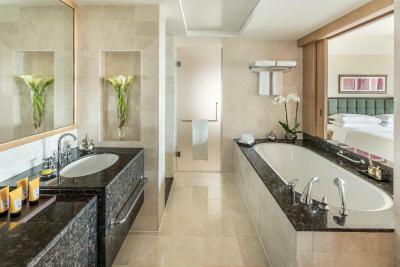 The bathroom features a separate bath and shower cubicle and complimentary toiletries. Free breakfast for children under 12 (maximum 2). 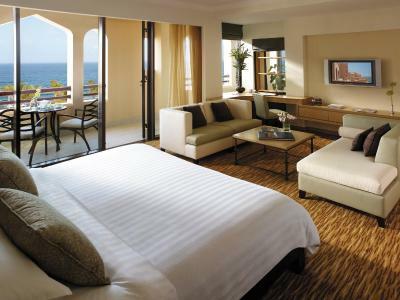 Located in Al Waha hotel, the Superior Rooms offer accommodations featuring direct views of the beach and the turquoise waters of the Sea of Oman. The balcony or patio are furnished with a table and two chairs. The bathroom features a separate bath and shower cubicle and complimentary toiletries. Located in Al Waha hotel, the family interconnecting room consists of two units of superior rooms with an interconnecting door. 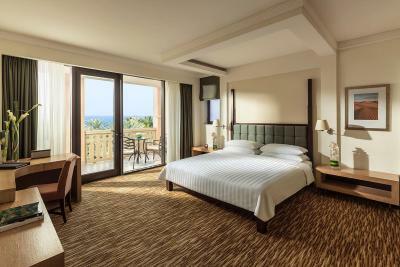 All rooms have pool or sea view, with balconies, and a separate bath and shower. The balcony or patio are furnished with a table and two chairs. Also features a DVD player and a Play Station. Free breakfast for up to 2 children under 12. Located in Al Bandar hotel, the Deluxe rooms offer accommodations featuring direct views of the beach and the turquoise waters of the Sea of Oman. The balcony or patio are furnished with a table and two chairs. The bathroom features a separate bath and shower cubicle and complimentary toiletries. Located in Al Bandar hotel, the Deluxe Rooms are very spacious and are decorated with modern, Arabian-inspired décor with views over the gardens and pools towards the Gulf of Oman. The balcony or patio are furnished with a table and two chairs. The bathroom features a separate bath and shower cubicle and complimentary toiletries. Located in Al Bandar hotel, the Deluxe Rooms are very spacious and are decorated with modern, Arabian-inspired décor with views of the beach and the turquoise waters of the Sea of Oman. The balcony or patio are furnished with a table and two chairs. The bathroom features a separate bath and shower cubicle and complimentary toiletries. Located in Al Bandar hotel, the Deluxe Rooms are very spacious and are decorated with modern, Arabian-inspired décor. The balcony or patio are furnished with a table and two chairs. The bathroom features a separate bath and shower cubicle and complimentary toiletries. 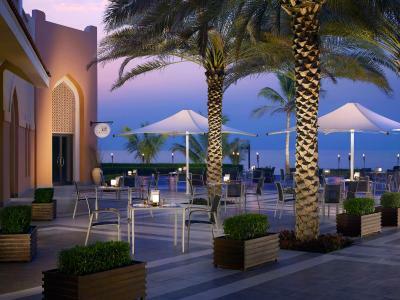 Located in Al Bandar hotel, the Premier Rooms feature luxurious, Arabian-inspired décor with memorable views of the lush gardens and the Gulf of Oman.It features a furnished balcony or patio, a separate seating area with a flat-screen TV. The bathroom is fitted with a shower and complimentary toiletries. Located in Al Bandar hotel, the One Bedroom Suite offers Arabian-inspired opulence, and they are ideal for guests traveling as a group or who require extra space and amenities. It features a furnished balcony or patio, a separate seating area with a flat-screen TV. The bathroom is fitted with a shower and complimentary toiletries. 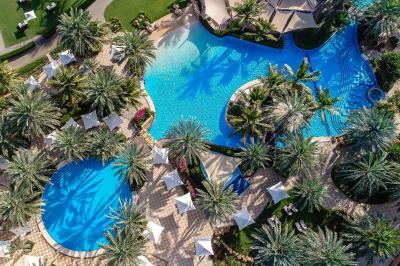 The experience is elevated at Shangri-La’s Barr Al Jissah Resort and Spa, the excitement heightens as a man-made tunnel through the mountain leads you to a sanctuary facing the Sea of Oman and surrounded by palm trees. 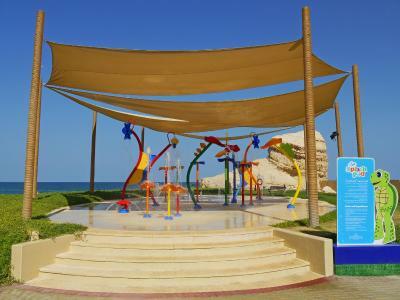 House Rules Shangri-La Barr Al Jissah Resort & Spa takes special requests – add in the next step! Any additional older children or adults are charged OMR 23.40 per night for extra beds. Shangri-La Barr Al Jissah Resort &amp; Spa accepts these cards and reserves the right to temporarily hold an amount prior to arrival. Shangri-La Barr Al Jissah Resort & Spa accepts these cards and reserves the right to temporarily hold an amount prior to arrival. 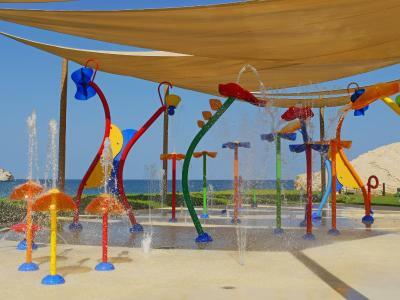 Please note that Shangri-La Barr Al Jissah Resort & Spa consists of 2 hotels, the Al Waha Hotel which is more a family friendly hotel with children's facilities, while Al Bandar hotel offers a mixed variety of dining and entertainment options. 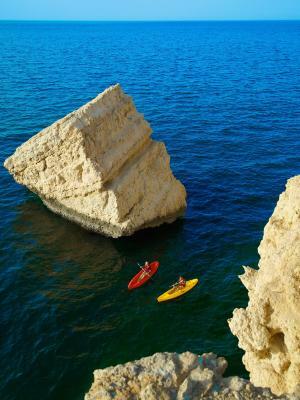 It is Oman, but it is fully priced. Amazing staff - made us feel very welcome. Fantastic lotion and nice beach. The dinner buffet was average but for 180 USD for three including a child and only water to drink, I would expect more . TV channels and in room entertainment package very poor . Also for any guests staying at this resort I strongly suggest applying for visas well in advance AND do take the option to cancel the booking in the event a visa is refused . One of our party was refused a visa to enter Oman and regrettably we had selected the cheaper option which did not allow for cancellation . Sun loungers old. Food in restaurants expensive. 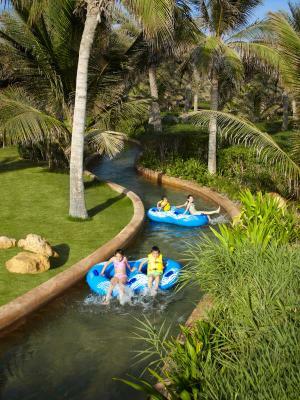 Lazy river warm and fun for kids. Choice at breakfast. The lack of evening entertainment- last year, there was an amazing (French) singer on the beach singing cover songs in English which was very special and the palm trees were lit up. There needs to be more kids activities all year round e.g trampolining/ making burgers/tennis and not just one week over Easter. We have stayed last Easter and had a lovely time so went back with our 2 children. We asked for the same interconnected rooms and were given them which was fantastic. They were spacious with sea views and adequate. The staff were exceptional at Al Waha, particularly Upendra who was always cheery and chatty and brought us coffee when we had finished without asking us. Nodirbek was also outstanding as was Andrew in their customer service and going the extra mile. We also wanted to thank Mohammed on Al Banda lawn and Mark, Masood and Adam who looked after us on the beach. The food was very good - we would have preferred the BBQ more than one night, like last year. My daughter is gluten free and the chefs were great at making her gluten free pancakes and meals. One suggestion is that the desserts are labelled. The beach, lazy river and setting are amazing. The snorkelling and kayaking is free. 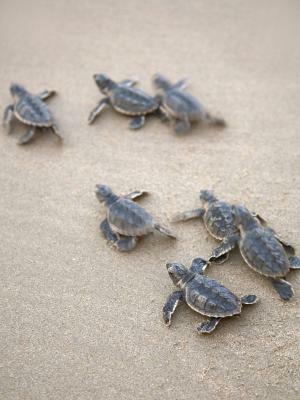 My children loved seeing the turtles/fish. My children joined in with some of the waterpolo and cricket activities which they enjoyed. There is no kids club for over 7’s and they felt that there could have been more activities for their age group and particularly for girls as it is very boy focused (football and touch rugby). Aaron was very good on the animation team but the team were not as impressive as last year. It was a shame that all the Easter holiday activities such as making burgers (which my daughter was looking for) were not on until Easter week after we have left given that we had travelled in the Easter hols. In England, the children go back to school on the Wednesday after Easter. 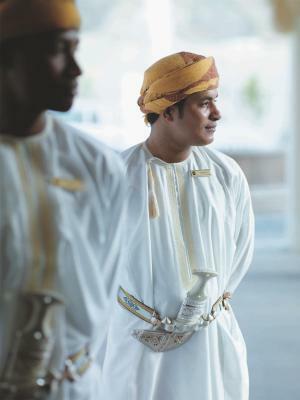 There was no evening entertainment at all other than Omani music at dinner. My husband really enjoyed the kayaking and cycling in the morning but noticed that since there was an introduction of a charge, the take-up was very low. Given the price of the hotel, we felt that these activities as well as the yoga classes should be free and not an additional £10. Room at al waha and breakfast at samba are basic. I would have expected more luxurious room and a wide variety for breakfast against the value of money I paid. I would say this was poor. At night it’s pretty dark in the outdoors area. Music around in the outdoors could have been nice. We really enjoyed our stay and will return. There wasn't anything to dislike.